What makes a great thrift store refashion? Next of the vloggers is Karina of Lifting Pins and Needles. 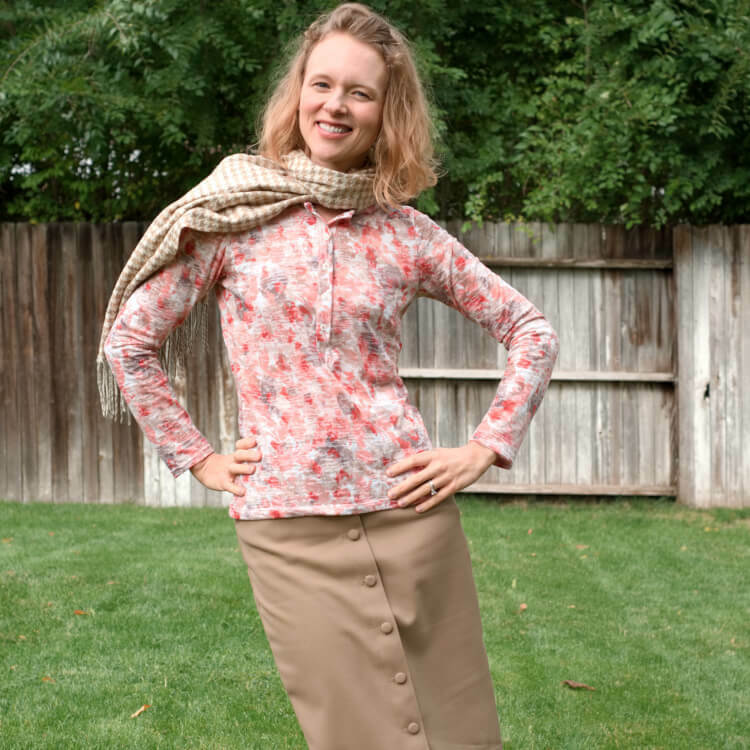 Her challenge was to take what she calls, “a boring old navy dress in ponte that I never wear” into something that fits her classic, chic, tailored, comfortable lifestyle. I’ll let Karina take over! I missed out on last year’s challenge due to an international move and lack of house and sewing machine! This year Elizabeth changed it and we did not need to make dresses! we had to pick a dress that is not being worn and create two garments to take that dress from a day to a night look. My day look is a refashion from an oversized linen blouse with sleeves and huge pockets on the bust. It started out several sizes larger than me. I added shape with fisheye darts and extra contouring of the existing princess seams. Now I have a piece that I love. I could be wearing this for years! For the night look I created a pattern hack from the Megan raglan tee by Style Arc. This top is out of chiffon which is one of my favorite fabrics to work with. 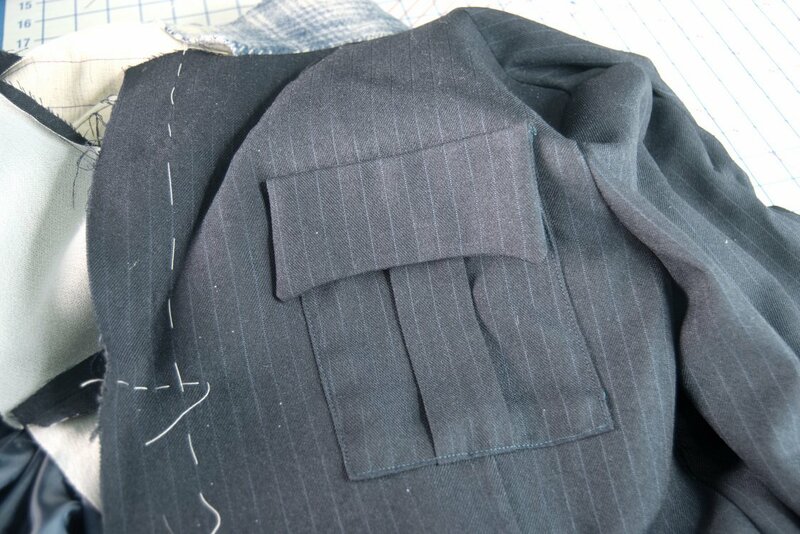 I left the back sleeve seam open and overlapped it with the back, uniting both pieces with bias tape. Drawing a freehand line, the back part of the sleeve and back piece are scooped out a little, making for a more dramatic slit. The line is blended back towards the seam for a nice little overlap. That’s it from Karina. Don’t miss Helena’s cool casual remix of the Named Inari dress. There’s lots of inspiration happening here today including my own colorful adventures with a blush ponte dress coral, olive, and lemon. HOW CAN YOU GET INVOLVED IN THE DAY AND NIGHT DRESS CHALLENGE 2019? Find your lonely dress in your closet! Sew up 2 extra pieces to coordinate with your dress for a day look and a night look. Let other people know about it. 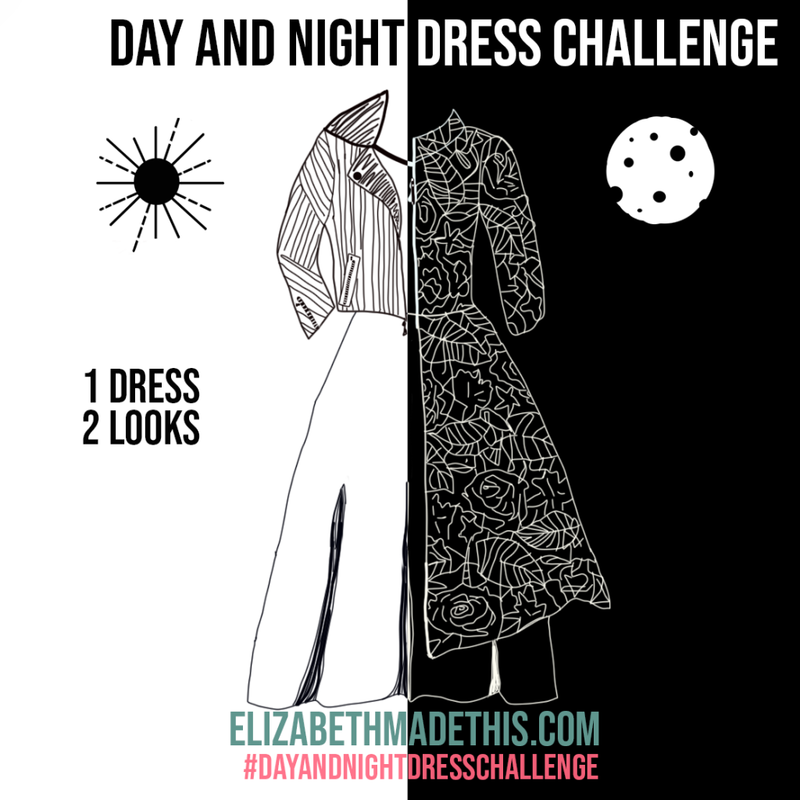 Use #dayandnightdresschallenge on Twitter and Instagram and follow the Day and Night Dress Challenge Facebook group. Keep reading here to find out the latest. Follow Elizabeth Made This on Instagram andFacebook. Post a picture of your newly styled dress and extra pieces in your day look and your night look to Instagram to enter yourself. Don’t forget to tag me @elizabethmadethis and use the #dayandnightdresschallenge. While the Lori and Maria have officially kicked off The Day and Night Dress Challenge, the vloggers are getting into the action too today. 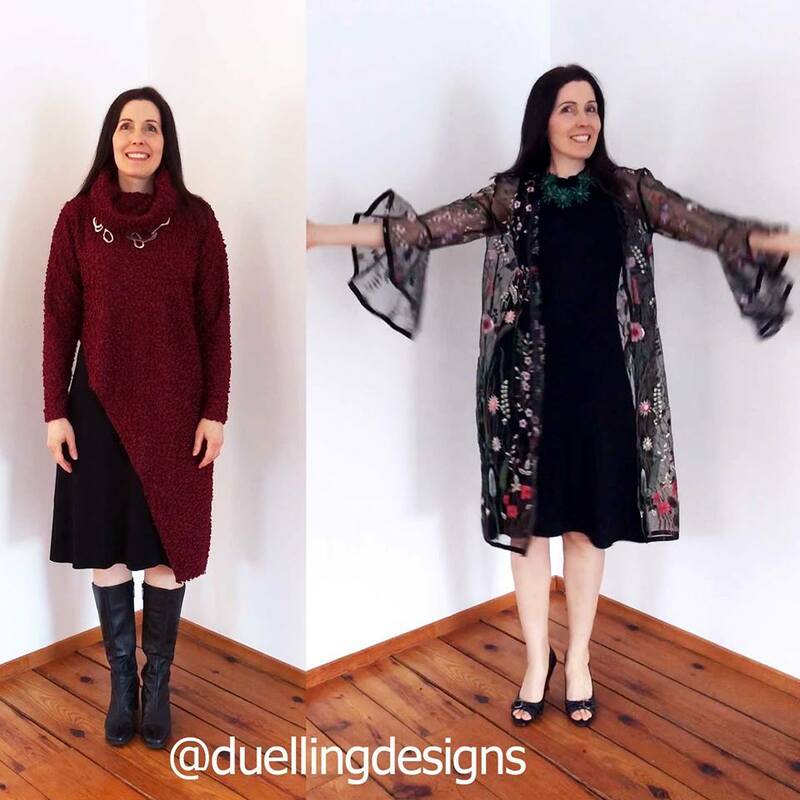 First up is Dawn of Duelling Designs with her too cool to cut fabric and winter cozy look. Her chosen sleeveless black dress is getting quite the wearable upgrade!! A lot of times wearing a sweater with a dress can be an afterthought. It’s something you do because it’s freezing outside but dang it, you still want to wear a dress. Dawn’s sweater for her day look though does such an awesome job bringing on the toasty while still incorporating the dress. Asymmetry makes everything better, and this is a good one!!!! For her night look, she’s cutting into some fabulous embroidered fabric to make a sheer duster. This one will be elegant wherever it takes her! That Sewing Blab is also encouraging sewists to cut into the most precious of our fabric stash. Check out the graphic above or see Duelling Designs for more info! I’ll be on That Sewing Blab Tuesday February 19th 7:30-8:30 US Eastern time on Duelling Designs to talk about my project along with several other ladies. The Blab is always a fun hangout to talk about sewing with friends! For sewists, we can feel the pressure to want to make handmade gifts for the people in our life. We want to show off our mad sewing skills AND give something heartfelt to our loved ones. Who doesn’t want to watch your child or your husband rip into a package and treasure it all the more because it was made just for them? But sometimes the pressure of making all the things can get too much, especially this time of year when the calendar is already filled with so much activity. Sewing should be fun, not stressful! So let’s tackle how to make handmade gifts for the holidays without going crazy. First, we’ll dive into helping you define your why when it comes to creating handmade gifts. Next, I’ll share some strategies that will help you identify projects that make great handmade gifts. Last, I’ll show you how to organize all your goods for a successful gift sewing experience. Why do you want to make handmade gifts? Before we start talking about what projects that make awesome handmade gifts, let’s define your why. Why do you want to make handmade gifts in the first place? Do you love sewing for others? Want to be able to show your love for your family and friends through your sewing? Is there lots of fabric in your stash ready + an easy project that you can sew up quickly for gifts? Good! Those are all great reasons to make handmade gifts. Which ones to choose??? What projects are good choices for handmade gifts? Things that don’t take a lot of resources and are easily repeatable can make wonderful handmade gifts. If you can cut out 10 and make it in a couple hours, you’ll be well on your way to being able to love your family and friends without a lot of headache. Here’s a whole list of easy video tutorials I put together last year for quick and easy projects for handmade gifts. Small projects like bags, scarves, mittens, or hats take very little fabric and can all be made in just a few minutes. 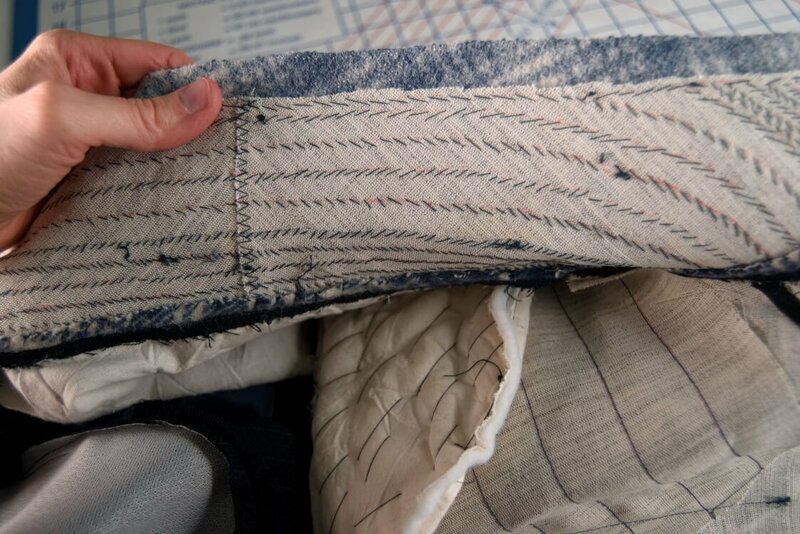 If you’re looking for a slightly bigger project, pajamas are a wonderful option. Sewists of all levels can easily tackle pajama bottoms for anyone. 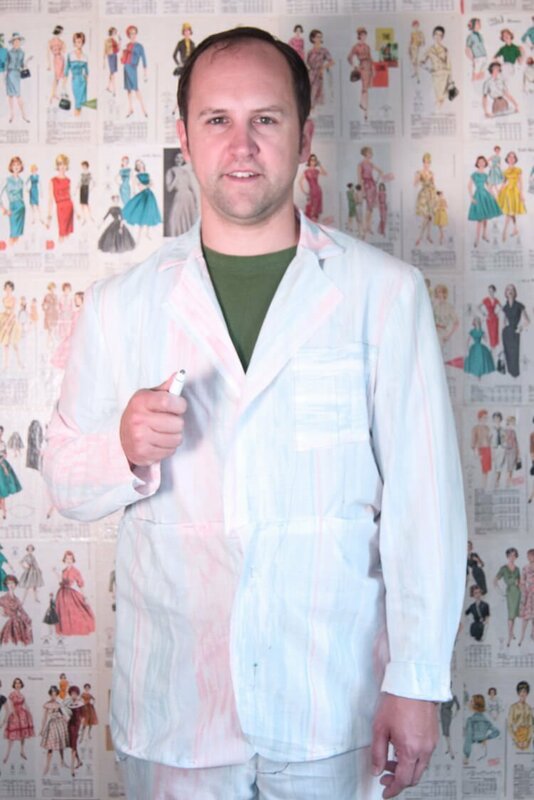 Pajamas get an extra vote because virtually every pattern company under the sun has an easy pajama pattern. Once you’ve found some projects that you might be interested in, do yourself a solid and use the same pattern for your gift sewing adventures. It might seem boring to do so, but once you’ve made up a project in multiple fabrics, each one will look totally unique. And shoot, if you want to use the same fabric, that could be cool too. Everybody loves a good matchy matchy pic of your family! Patterns that come in multiple sizes are perfect for this kind of thing. A pattern that’ll work for every single person on your list is pure gold. It’ll save you time of searching through your stash or looking online for that perfect pattern for every member of your family. Don’t forget the power of the one-size fits all pattern too! 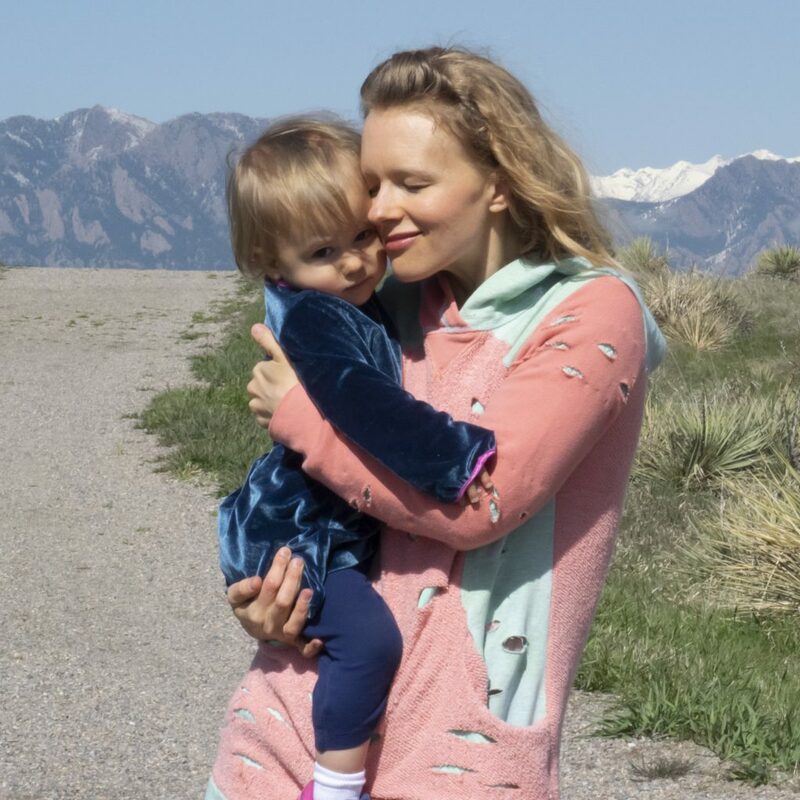 Some of my favorite pj patterns–they have been loved through nearly every size! So you’ve identified your project, you’ve found the perfect pattern that’s going to serve all your needs. Next, how do you prepare for the best, non-stressful sewing session? Ok, cleaning your sewing space isn’t fun to do, but a clean work area will really help clear your mind for a round of stress-free sewing. 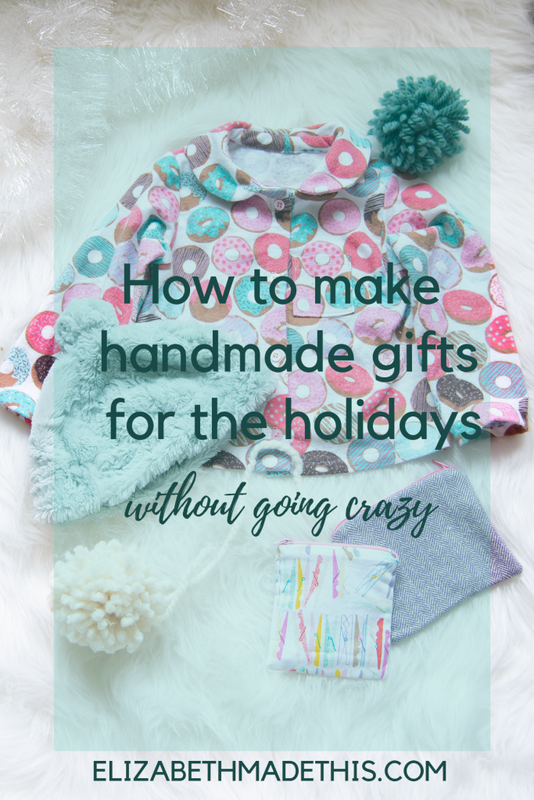 You’re going to have a hard time making all of your handmade gifts in a cluttered room. If cleaning the whole room is going to be too much, just clear out a small area that can be totally uncluttered and dedicated only to your project. You’ll be amazed at how much a little organization can help! Check out my sewing room tour. You’ll walk away with some great thoughts on organization. Determine which fabric you’re going to use. Will you be using the same fabric? Did you buy enough to cover all your needs? I know certain fabrics like flannel come in obnoxiously and seemingly ever-shrinking narrow widths, so I have to constantly remind myself to buy extra! What if you’re using stash fabric? Will this be a scrap-happy project? Whatever fabric you choose, wash and dry all of it. If you’re using scraps from another project that you’ve saved, set them all out in a work area and double check to make sure your pattern pieces will fit. Do you need any special notions like zippers, interfacing, bias tape, or buttons? Gather all those things out and set them in a pile with each fabric. Finally, don’t forget to sew with love. Remember who you’ll be making things for, and the affection you want to share with those people. With these things in mind, your work will become a joy and not just one more thing on your list! So we’ve looked at defining why you want to make handmade gifts, what projects make awesome handmade gifts, and how you can begin to set yourself up for a stress-free gift sewing session. Stay tuned next week when I’ll be sharing some awesome pajama patterns that are perfect for handmade gifts! Until then, you can sign up for my newsletter and get a free Holiday Sewing Project Planner. It’ll help you organize your thoughts and get you going in no time! Just click on the image below to join my newsletter, and you’ll have happy mail from me in no time! Wow, after a jam-packed week, we’ve reached the end of the vlogger/blogger part of The Day and Night Dress Challenge. Perhaps I need a big cup of fancy tea to celebrate/be a little sad. But before we go, be sure to catch these videos from these lovely SewTubers! This is your daily vlogs #5. 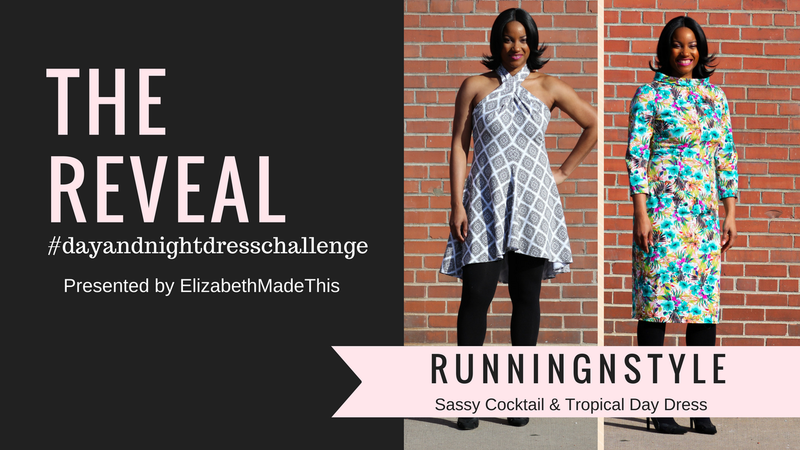 Renata of Runningnstyle chats about her dresses. There’s sass and tropical fun + working under pressure. Speaking of working gracefully under pressure, Doja of Elewa shows off her dresses inspired by Black Panther. Read about her process for creating her dresses here. Myra of Myra Lorraine makes two absolutely stunning dresses. Best. blue. ever. The blogger and vlogger part of The Day and Night Dress Challenge may have ended, but there’s still time to be a part of this challenge! WANT TO JOIN IN THE FUN YOURSELF? 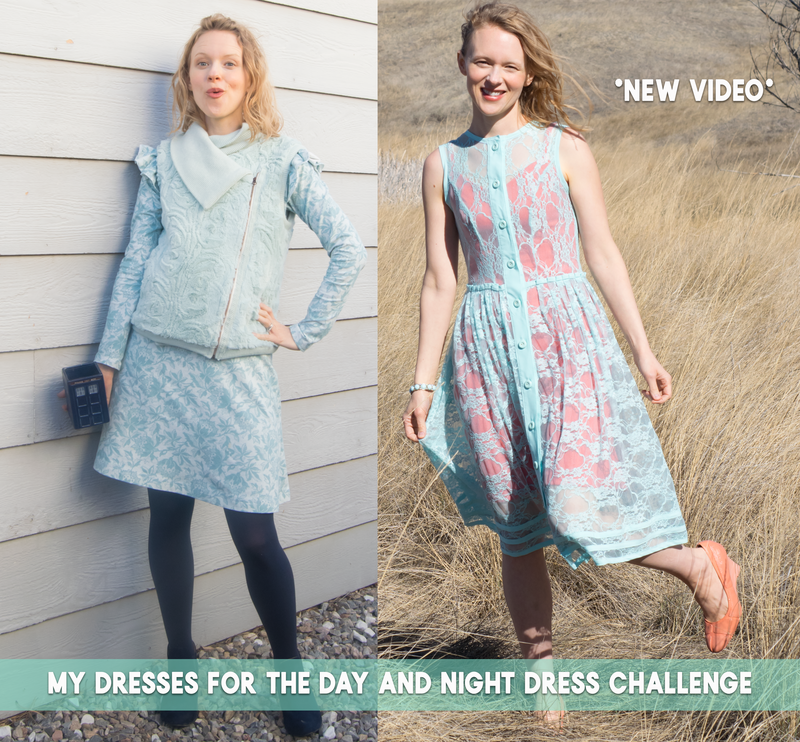 HOW CAN YOU GET INVOLVED IN THE DAY AND NIGHT DRESS CHALLENGE? Post a picture of your day look (coffee) and your night look (cocktail) to Instagram to enter yourself. Don’t forget to tag me @elizabethmadethis and use the #dayandnightdresschallenge. During the duration of the blogger/vlogger postapalooza for The Day and Night Dress Challenge, I’ll be posting the daily vlogs that pop up on YouTube regarding the challenge. This is my collection of daily vlogs #1. First up is my video about my dresses. You’ve read about them here, now see them! I also sneak in a mini fork pleating tutorial. Good morning everyone! I’ve been looking forward to Sew Saturday Snippets #2! If you missed Sew Saturday Snippets #1, this is a new series here where I’m highlighting cool makes, sewing community challenges, and sewing videos. If you’re interested in being featured on an upcoming edition of Sew Saturday Snippets, email me at elizabethmadethis@gmail.com. Grab a cup of tea and let’s be inspired together! I’ve been sitting on this project for a couple weeks now absolutely DYING to share these pants. Ice dyeing is something that’s been on my radar for a couple of years, but I’ve been hesitant to jump on board. When I bought a really nice, but very white length of jeggings fabric from LA Finch Fabrics, I thought the time was now for these ice dyed jeggings. Hey all! I’m deep in the throes of making my husband’s Doctor Who suit. Just the finishing and bagging the lining is left, plus a little more work on the pants. Since I don’t have a full project to share, I thought I’d pop in to catch you up on what’s happening on Elizabeth Made This on the video front. First, here’s my tips for sewing faux leather. There’s other tips in the video, but firstly, to be successful in sewing faux leather, mostly, just be fearless. Fear not the faux! And practice with your scraps and start small! My first faux leather project was a simple belt. That belt’s chief design feature is wonky topstitching, but it taught me a lot. I have yet to buy a bad piece of fabric from Fabric Mart. Of all of the online stores I’ve bought from, they really seem to most consistently have the best prices for the quality of the goods. It’s probably good that they don’t have free shipping, or I’d be buying from them a great deal more! Oh, the matched pinstripes and that pretty shaped pocket. While they’re not my best welt pockets, this was #5 in the jacket. I won’t beat myself up too much either, this being only the second time I’ve made welts from lining fabric. I couldn’t go through all of the work of padstitching without showing all of the work. I finally get why people get into tailoring. 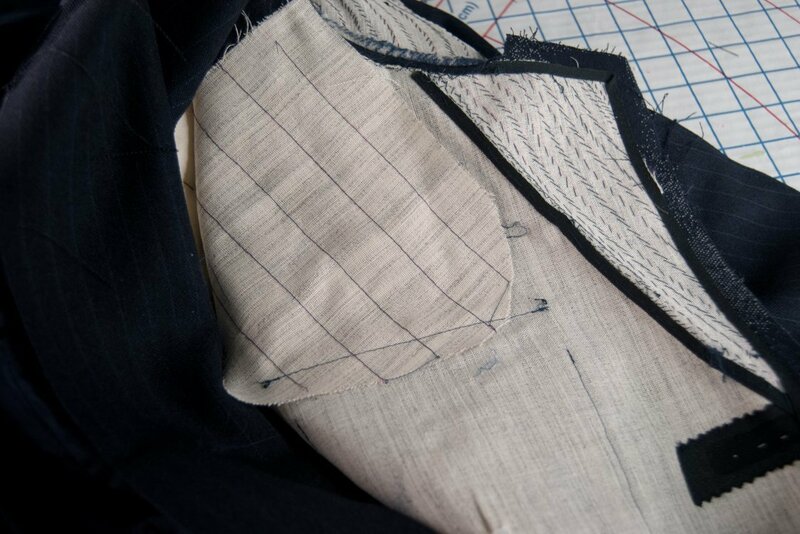 There’s something truly magical that you get to see as each stitch shapes those lapels. You think that part of the jacket just sits that way on its own? No. Tailoring is careful manipulation of the fabric. I did most of the undercollar while watching my sons play soccer. And those custom shoulder pads are fusible fleece + bias cut muslin + love. This is a bit of a nothing sort of project, but this month I suppose I need something quick and easy. With my husband’s Doctor Who 10th Doctor suit on my docket, a super simple project is just the thing to keep my brain from being overwhelmed. There’s no less than 39 pattern pieces for the suit! This fall henley top was just what the Doctor (ha ha!) ordered! I’ve had this burnout jersey from Emma One Sock in my stash for a couple of years now. I dithered for a really long time trying to find the right pattern to show off this beautiful fabric. It’s even been washed and ready to go since Spring, yet I hesitated. Do you ever do that? Get all ready for a project and then shelve it because you simply forget about it? I’ve talked before how I don’t often have unfinished objects (UFOs). Instead, I deal in NSOs (not started objects). I’ve made this henley top before. Burdastyle 12-2009-121 is a good basic henley, but when I went to make it, it occurred to me that all I needed to do was trace off the front placket and a copy of the neckline. The front is a standard tee, but the CF is cut about 1/4″ away from the fold so you can sew in the placket. That’s it. There could hardly be a more simple tee variation. I was able to do a first muslin of my husband’s suit. The pants only need length changes, but the jacket will take a little more work. He has a slightly more rounded upper back which will require a horizontal dart, plus he needs more width across the back and a little more breathing room in the hips. He’s traveling this week, so I won’t be able to do the changes and forge ahead, but that’s okay. I realized this week that planning for a big project takes up a lot of time but also a lot of mental space. While pondering this, I came up with 6 tips for planning a big project that will help you keep you from burning out when you reach the end. Have a look! So I’m sharing something different today. Renata of Runningnstyle and I have been talking about doing a collaboration for a while. In talking, we came up with several ideas and decided to do a series of collaborations. We wanted to involve the sewing community too in these. We’re calling this Sewist Admiration Society. What is Sewist Admiration Society? I got the idea of calling this Sewist Admiration Society as I was thinking about wanting to create something that is about sewing with your friends. We all have things that we do well in our sewing, so why not celebrate that together? There’s so many sewing competitions out there, but let’s just do something that’s not competitive at all. Do you have a friend whose work you admire who you’d like to get to know better? Ask them to join in on the fun. It will be a great way to build friendships within our sewing community as well as an opportunity to keep each other accountable for our sewing projects. It’s easy to get excited about a project and then let it fall by the wayside. With this, you and your friend can help support and encourage each other to keep going! The first challenge for Sewist Admiration Society is jackets. Sew any jacket from any pattern. You and your friend can sew from the same pattern or you can choose different ones. But I don’t know anyone in the sewing community. Pshaw, friend. Risk sending an awkward correspondence and make a friend. Let me help you. Dear ________, my name is _______. I’ve been watching you make beautiful sewing projects online for a while, and I think you are amazing! That _____ that you made was so creative and inspired me so much for my next garment! I would love to work on a project with you. Would you consider joining the #sewistadmirationsociety that @elizabethmadethis and @runningnstyle are hosting on Instagram? We have to sew up a jacket by the end of September and post it together. Also, let’s be friends. The worst someone can say is no. That’s not so bad, right? –We’re hosting Sewing Admiration Society on Instagram because I think most of the sewing community at this point is on Instagram, and if you’re not, might I invite you to hang out there?! -Post a pic of your jacket and your friend’s jacket by September 30th. -You can collage your pics or choose the multiple image. -Spread the word too. I’d love to have people join us for this! Feel free to repost on Instagram, or grab an image for your blog. If you have any questions, please hit me up here in the comments, via email elizabethmadethis at gmail, or on Instagram @elizabethmadethis. Renata and I have also recorded little intro videos about the challenge, so you can check those out below. I'm a wife and mama to 4, sewing nerd and refashionista with a passion for DIY. Let's sew something creative together! All images, text, and other content copyright Elizabeth Farr. Do not use any content from this site without permission and consent. If you see something that you like, please email me elizabethmadethis@gmail.com.